My aunt’s friend Lee was driving home after having dinner with The Girls. All of a sudden she realized she didn’t have her handbag! She frantically tried to remember what was in it, especially in her wallet, but her mind went blank. Panicked, Lee called the restaurant. It wasn’t there. Although it seemed futile, she drove back to the restaurant. Between when she called and arrived, it had been found! Lee was lucky. If your wallet were lost or stolen, could you remember all the credit and membership cards, ATM and debit cards, medical insurance, driver’s license and registration cards, and the rest? Of course not. But even if you could, would you know the account numbers and contact info to report them missing? Not unless you have hyperthymesia or are a savant like Raymond Babbitt in Rain Man. And consider the MANY hours it would take to figure it out. To protect yourself, here are 9 tips. Use smartphone apps such as a mobile wallet to pay electronically or Keyring to store your reward cards. 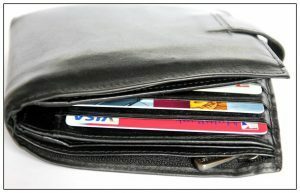 Create a list of the documents in your wallet and organized by category, such as credit cards. Using a word processing program makes it easy to update the list as items are added and deleted. Include the name of the issuer, account number, contact info and expiration date, if applicable. Keep a copy in a secure location at home, another in your safe deposit box and give one to someone you completely trust. Photocopy or scan the documents, front and back, and refer to #2 about safekeeping. Remember to add new items and delete unwanted ones in whatever system you use. Distribute as necessary as stated in #2. Ladies often leave handbags unattended in shopping carts or hung out of sight on the backs of restaurant chairs. Either keep your bag with you or keep an eye on it at all times. During the summer months we spend more time outdoors. We’re more relaxed and perhaps less guarded when down the shore or picnicking in the park. Pay attention to your personal belongings at all times. Be sure there is adequate security protection for whatever method you choose. This is a perfect time to remove rarely used cards and accumulated clutter. If you think any of these options is too much trouble, ask yourself how much trouble it would be if your wallet were lost or stolen and you didn’t know its contents or the contact info. The payoff is having readily accessible information so you can take immediate action. We don’t intend to create opportunities for theft. But, if it happens, your record will be a vital resource. How thrilled would you be that you took time to protect yourself? previous post: What Are You Really Teaching Your Kids?